A sequencer board is the main circuit board that controls all the functions of a garage-door opener. The Genie Excelerator has two sequencer boards linked by a ribbon cable, the motor-drive board and the controller board. The motor-drive board includes the transformer that converts the 110-120 volts down to the needed 24 volts, and the relay switch that turns the light bulbs in the motor unit on and off. It also activates the Excelerator's 24-volt DC motor. The controller board controls the speed and motor force. It also stores the memory for remote devices and powers the wall button, safety sensors limit switches and the motor's RPM sensor. In many cases, you can uncover what's not working properly with tests you run on your own. Genie Excelerators lift garage doors at twice the normal speed. Unplug the motor unit. Use the screwdriver to remove the four screws that hold the motor cover to the chassis of the garage-door opener. Shine a flashlight on both the motor drive and controller boards. Look for burn marks or melting -- signs of electrical damage. Circuit boards that show signs of electrical damage will need to be replaced. Put the motor cover back on. Pull the red handle that extends from the black, plastic carriage that travels along the rail. Manually lift the door to the halfway point. Push up on the metal handle the red cord is attached to. This will lock the carriage back into place on the screwdrive rail. Plug the motor unit back in and activate the garage-door opener. Operate the door, if it will move, through at least three up-and-down cycles. 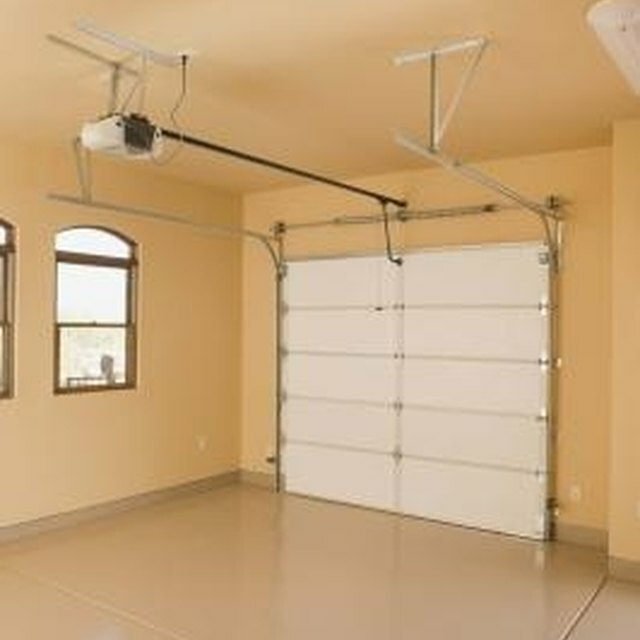 Compare the movements of the garage door with the components of each board. If the unit refuses to activate at all, has no power, or if the light bulbs display erratic symptoms, then the motor drive board will need to be replaced. If the unit is active but will only travel short distances, or if it ever runs at the accelerated speed on the downward movement, then the controller board needs to be replaced. Elizabeth Warner began writing professionally in 2004 for “The Scroll,” an award winning collegiate newspaper. She currently works with the technical writers at The Overhead Door Corporation. She holds a Bachelor of Science in English with an emphasis in technical writing and editing from Brigham Young University-Idaho. How do I Replace a Hunter Douglas Thermostat Battery?